Thermokor Kft., Hungary’s largest cold storage, food industrial and hospital/clean room door manufacturing company, has been manufacturing and continuously developing special doors and windows for various industrial uses that conform to the requirements of the age for more than 20 years. Our company manufactures several hundreds of products in a year for Hungarian and foreign markets, primarily for food industry and cold storage purposes, for shopping centres, warehouses, meat processing plants, but we also have an important role in producing hospital doors and windows. We recommend our special doors for use in the pharmaceuticals industry and for other fields demanding the use of clean area technology. Our product range includes manually operated and automatic sliding (side-sliding or vertically opening), normally operated or swing doors satisfying any demands, PVC strip curtains, stainless steel covered air curtains, bedpan washing equipment and custom-built handrails, tables, shelves and other fittings made of non-corroding material. Our doors designed and constructed to suit the demands of cold storage and food industry are manufactured with polyurethane foam technology of a high heat insulating level, with a thickness of 40-160 mm depending on the door types, from stainless steel or polyester coated plates. In each case the doors come with stainless steel frame structure, and in cold storage temperature range the doors are fitted with a threshold sunk below the floor level and with a built-in heating. Smaller doors and doors used in normal temperature range are fitted with a frame closing the panel opening, which is extremely simple to put in and is also suitable for covering the panel edge, so there is no need for a counter-frame or for subsequent panel closing when putting in the door. 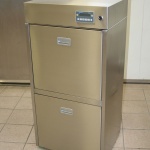 For use in cold storage rooms we recommend manually operated or automatic single or double normal-operating, sliding or swing doors, and for use in large food industrial rooms where no heat insulation is required we recommend 40 mm thick sliding, doors, normal-operating doors without insulating rubber, and 3 different types of swing doors. We offer ordinary safety locks or safety locks with emergency handle inside, doors with inspection window, with frame-mounted upper guide-runner, with external mechanical shock-protection and with air-pressure flush-out valve. On the basis of its many years of experience Thermokor Kft. 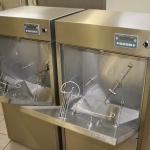 has developed energy-efficient bedpan washing equipment, which uses low amounts of water, chemicals and electric energy. 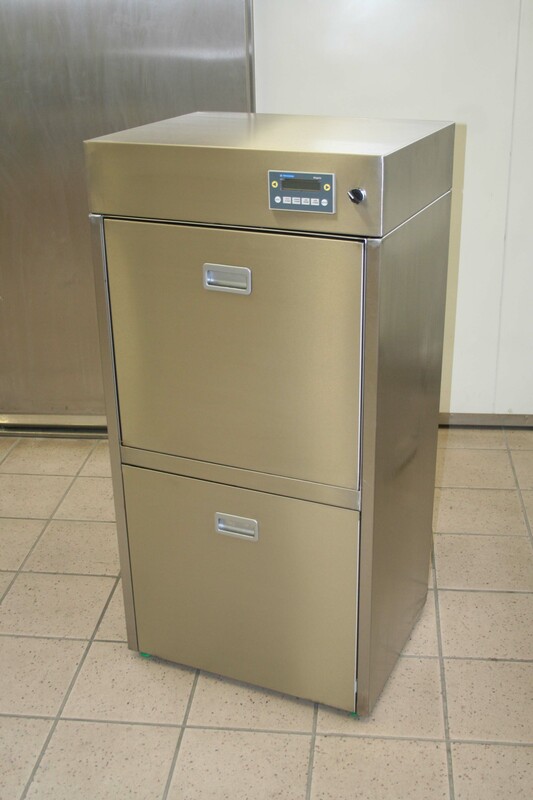 The equipment performs the automatic washing and disinfecting of various healthcare vessels e.g. bedpan, urinal bottles, night pots, etc. according to various selectable programs. Washing is carried out with two rotating heads and 3 built-in spray heads. The device has a non-corroding frame and covering, the internal structure is produced on the basis of the types of vessel the client wishes to use, but this may only be changed with the replacement of the reception structures. The equipment is mounted on a stand and may be connected to a bottom or back draining outlet. 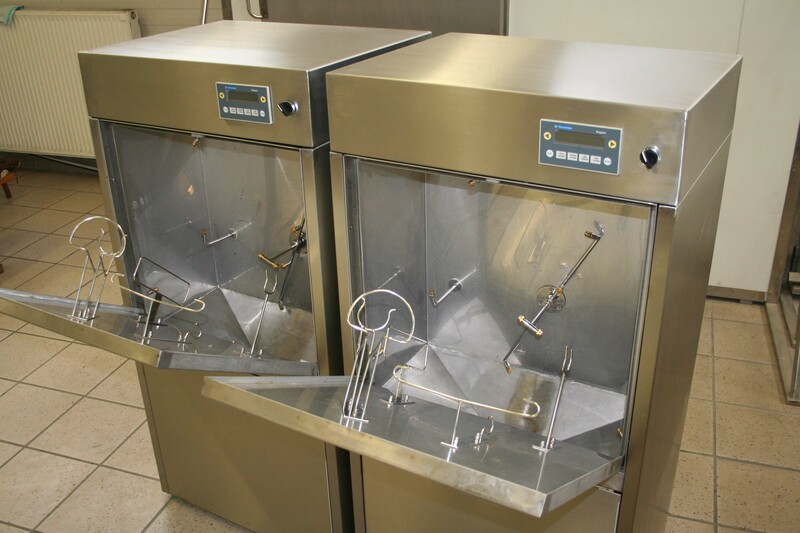 The bedpan washer may be primarily used in hospitals, care homes, day-care centres and nursery schools. We recommend doors conforming to clean area prescriptions for hospital and pharmaceutical industry uses, where nothing protrudes from or is depressed into the plane of the door wing (e.g. the inspection window and its frame, bottom guide rail) due to this there is not bacteria-collection or dust trap surface. The doors are 50-60 mm thick, their material is polished non-corroding or special polyester coated galvanised plate. The frame structure is in all cases made of a stainless steel material, in customs sizes conforming to the various wall structures or plasterboard structures. We recommend Swedish BESAM electric door openers for the operation of automatic hospital doors, these are top quality, reliable products. If required we can provide various levels of radiation protection in the doors, in the built-in inspection window and in the frame. All rights reserved! Thermokor Kft. 2010.